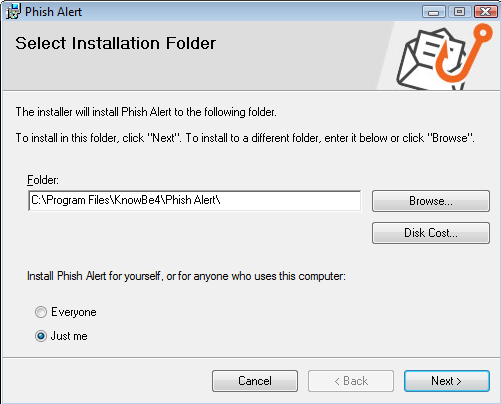 The Phish Alert Button (PAB) add-in for Outlook gives your end-users the ability to report suspicious emails and empowers your employees to take an active role in managing the problem of phishing and other types of malicious emails. The tool can also provide your IT or risk management team with early warning of possible phishing attacks or malicious emails so they may take timely and effective actions to prevent security breaches or network compromise. The Outlook Client add-in can be installed on Windows 7/8/10 machines with Outlook 2010/2013/2016 installed on both 32 and 64-bit platforms. .NET version 4.5.2 or newer is required. Port 443 TCP (SSL/HTTPS) should be open outbound for SSL/HTTPS connections to training.knowbe4.com or eu.knowbe4.com (depending on where your KnowBe4 account is located) on all workstations where the add-in is installed so it can connect to our servers. Administrative rights to install software on the workstation. Step 1: Click the "Next" button. Step 2: Enter your License Key. This information can be found in your Account Settings. Step 3: Click the "Next" button. 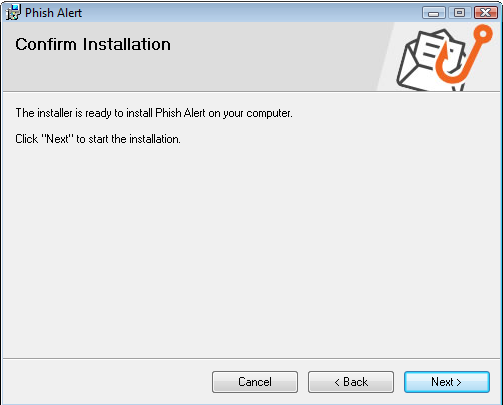 Step 4: Select the installation folder for the Phish Alert and click the "Next" button. Step 5: To confirm the installation, click the "Next" button. Step 6: Your PAB installation is complete. Click the "Close" button. The command-line installation method allows the PAB add-in to be installed using standard msiexec installation procedures and can be deployed organization-wide using Group Policy. 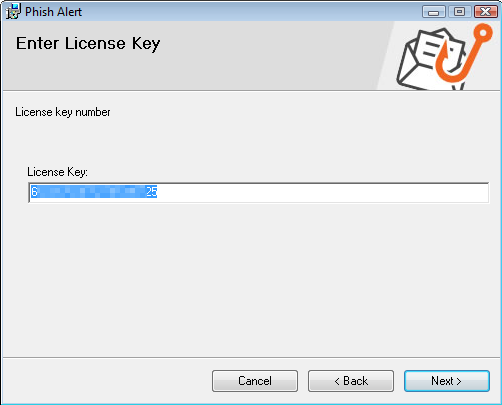 This is an example License Key. You can find your License Key under your account settings. This is a startup script, so it will run as the system account. Make sure Domain Computers have access to the shared folder you create. 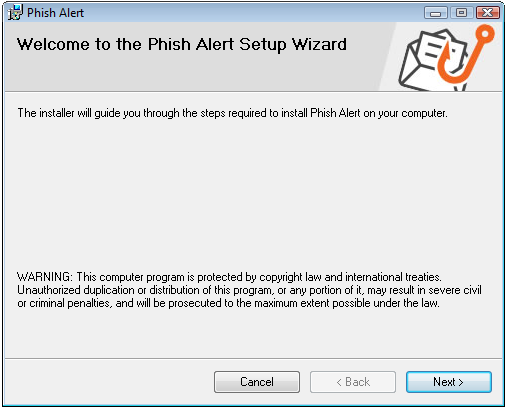 Step 2: Copy the PhishAlert.msi file into this directory. Step 3: Create a batch file in this directory: phishalert.bat (making a copy to the C drive is not mandatory). Create a new GPO under Computer Configuration. Navigate to Policies > Windows Settings > Scripts > Double-click "Startup". Do not include any spaces in the network path. If the network path has any spaces, the GPO will fail to install. Step 5: Click "OK" and close the Group Policy Management Console. Refresh the group policy on the client by running the gpupdate /force command from the command prompt. Check for the group policies installed on the workstation by running the gpresult /r command from the command prompt on the workstation (as an admin). 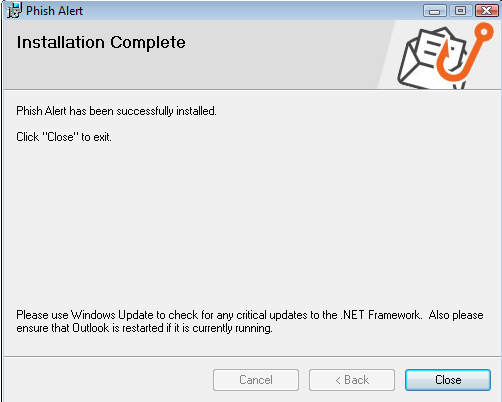 To verify the installation succeeded, open Outlook on the workstation you installed and you should see the PAB in the toolbar. Once installed, the PAB add-in will appear as a button in the ribbon area of Outlook, and as a right-click option in an open email. Paid Only: If the email was a simulated phishing email from us, there will be a pop-up message telling the user that they correctly identified a simulated phishing attack. This will be reflected in the console as a Reported email. If the email was NOT a simulated email, but possibly an actual malicious or phishing email, the email will be forwarded to the email address(es) set in the account area of your console and the email will be attached as a .eml file for analysis by your IT security team. Optionally, you can choose to have a copy of the email forwarded to us for research and analytic purposes. We strongly encourage you to enable this option. The reported email will be in the user's Sent Items as a forwarded message and deleted from the user's Inbox. If the user incorrectly reported the email, they can retrieve it from their Deleted items/Trash. 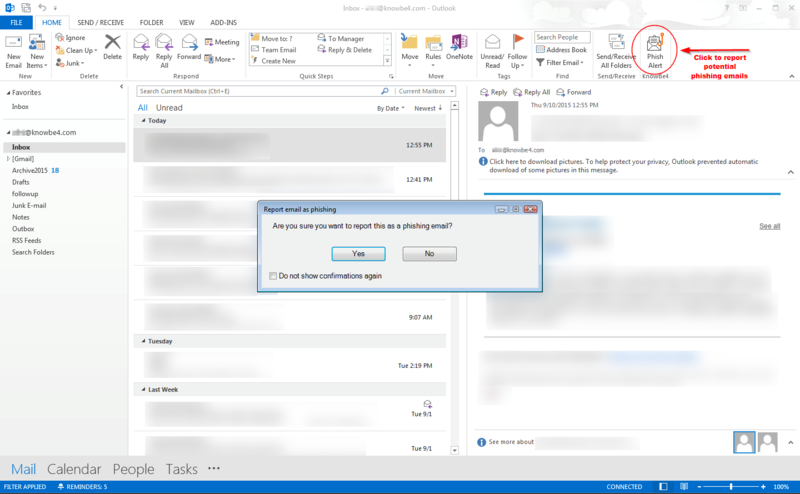 To instruct your users on how to use the PAB, you can provide our How Do I Use the Phish Alert Button in Outlook? article.